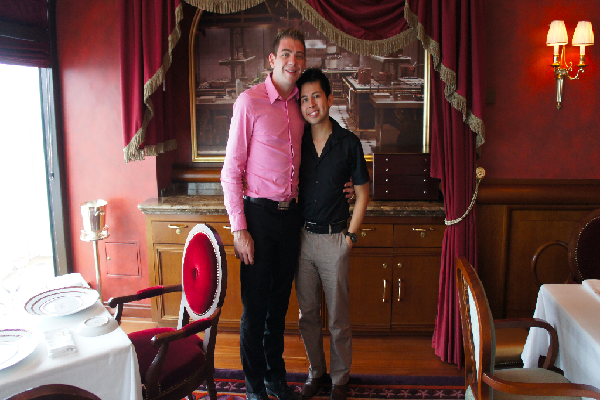 My husband and I love to eat at nice restaurants, so when we booked our cruise on the Disney Dream, I knew we would end up in Palo, but Remy seemed a little out of reach. I was surprised to learn there is a Remy brunch option available at a reduced price. Read on for my review of the experience. 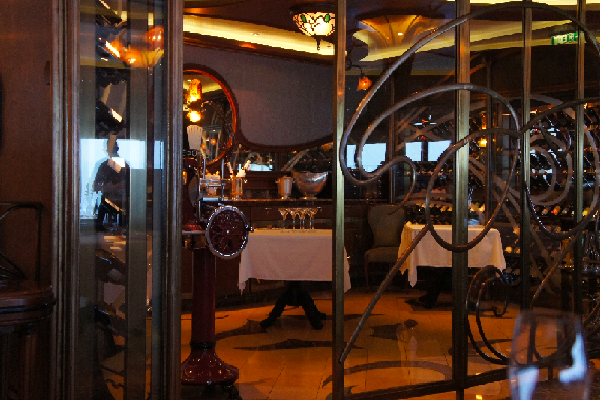 The Remy brunch was offered as a test on select sailings and is now available on sailings with a day at sea. As far as I know, you can’t book it online. You have to know about it to book it! 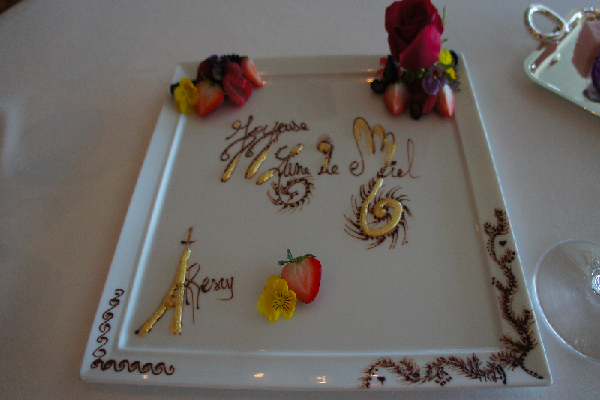 When we got on the ship, we went to the Palo reservation area and were told about the Remy brunch offering. Since it offers a reduced price of $50 per person rather than the $75 that you’ll pay for dinner, we thought we’d give it a shot. I really wanted to experience Remy and one of the biggest selling points to me was the one-on-one interaction with the chef. We entered and had a meet and greet with the chef, while we sampled Pata Negra with a glass of champagne and were given a background of the custom machine made specifically for Disney Cruise Line to slice the meat paper thin (pictured above). We were seated with a wonderful view of the ocean. Unfortunately it was pouring, but that just made us even happier to be inside Remy! For our seating, each table had its own server, so it was very personalized service. We opted for the champagne pairing which was an additional 25 dollars per person, but well worth the cost. I am not a seafood fan, but I always say if you’re going to try something new, try it somewhere like this, so I gave everything a shot and was surprised it was to my liking, even the sea bass. The service was impeccable as I would expect. Each table had its own dedicated server to watch your every move and make sure you were enjoying your meal, yet they weren’t noticeable, which was perfect. After brunch, we were taken to the Gusteau Room, set up to mimic the restaurant in the film. That’s exactly what I was looking for in terms of the experience and was completely thrilled to check it out. Overall, the brunch was a nice way to get into Remy and enjoy a similar experience without the price being quite as high.